The conservation of extensive medieval schemes, such as those at West Chiltington and Ford in Sussex and at Selling in Kent, is always a joy and is carried out on a fairly regular basis. More exiting, however, is the rare opportunity to uncover a complete, and previously untouched, 14th century scheme such as that in the tiny church at Sutton, near Shrewsbury in Shropshire. 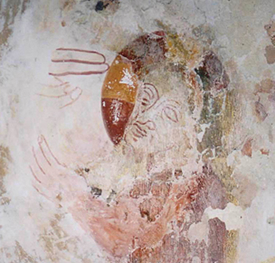 The most significant find was the scene depicting the martyrdom of Archbishop Thomas Becket.